Beginning July 1st, the Freedom Fantasia show will be at the Triple Door for three nights. As 4th of July is just around the corner, this is the perfect show to help celebrate the festivities. Comedy, song, burlesque, and dance is what you will see. The show celebrates the highs and lows of America with patriotic satire. 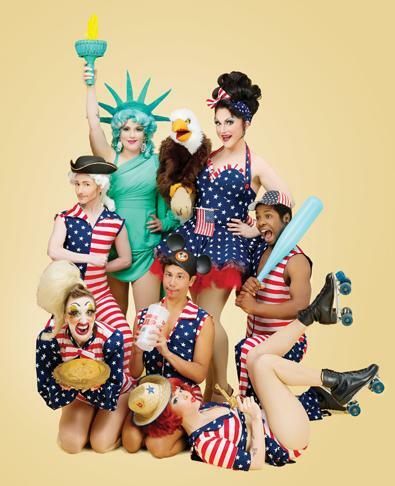 Featuring the combined talent of Seattle’s drag with a glittery stage and red, white and blue costumes. This show has gotten good reviews from the Seattle Weekly, Seattle Gay News, the Stranger, and more. DeLouRue Presents was named “Artists of the Year” by City Arts magazine. The performance will be July 1st – 3rd. For more info and to purchase tickets, click here. I have driven to Seattle but and stayed in Yacama for just one night.. I have always wanted to stay longer than a night because it looks like such a wonderful city… So much to do and great rainy weather… This show sounds amazing! Seattle sounds like such an awesome place to visit! I have always wanted to go, but haven’t really made more than 1 state over from California yet. Hopefully I will make it up there to see the sights someday. Oh man! I’m bummed to be missing this since we are leaving to go out of town. The Triple Door is such a great venue and the show sounds like a blast! I’m glad to have found your blog though! Bookmarked :-). Thanks for reading! Seattle is definitely a great place to live. There is constantly so many events I’m finding to blog about. I’m never short on content. Angie, there will be future shows posted from the Triple Door so feel free to subscribe to my blog. It was a great show!